Living in a post-war poverty stricken 1950’s London, Alan Roberts and his father William made a living out of turning discarded cardboard boxes inside-out, re-gluing and re-selling the boxes. Inadvertently, the East-End business borne out of necessity was actually recycling, generations before the rest of the industry even grasped the concept. Wind forward 60 years from this father and son partnership selling cardboard boxes out of a van, and now the WE Roberts (WER) Group is the leading integrated manufacturer of corrugated cases, cardboard boxes, PoS and packaging solutions in the South East. Attaining a reputation as impressive, prestigious, and as inventive as its history, Northfleet based WER has established its business with skilled staff and investment in the latest technology. 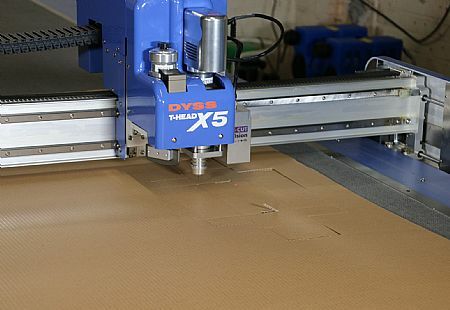 This technology now includes a new DYSS X5-1630T digital cutter from AG/CAD. The relationship with AG/CAD dates back to 1998 when the Kent Company recognised a bottleneck with its sample making department. Employing a highly skilled sample maker that worked around the clock to design, draw and hand cut samples, WER identified the need to employ modern methods to stay ahead of its ever-increasing sample demands. The answer in 1998 was to purchase a KASEMAKE KM602A cutting table from AG/CAD. Sturdy, capable and above-all reliable for almost 20 years, the old table was capable of producing up to 20 samples a day, a leap forward from hand cutting 5-6 samples a day. In September 2017, the KM602A was replaced for exactly the same reasons that it was installed 20 years ago. Whilst the managerial strategy to increase output and generate on-going efficiencies is reaping rewards, the requirement for samples has climbed exponentially. This put greater stress on the design and sample division, in particular, the aging KM602A cutting table. WER acknowledged the bottleneck and eliminated it by replacing the KM602A with the new DYSS X5-1630T digital cutting table. The DYSS has wiped out 75% of on-machine cutting hours for the Estimating Manager. The ISO: 9001 certified company now has the capacity for sample growth and quality is significantly improved. Added to this, sample lead-times have been reduced from 24 hours to just a couple of hours. 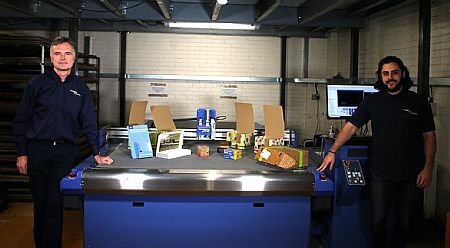 The typical production runs for WER can vary from 5,000 to 25,000 boxes whilst the state-of-the-art case-making machine can process up to 17,000 cases per hour. As well as achieving such high production quantities, WER has the flexibility and capability to manufacture everything from retail-ready packaging, shelf displays, industrial packaging, PoS, die-cut boxes, transit packaging and much more. Specifying the DYSS X5-1630T digital cutter with the 2T-Head configuration that consists of an oscillating knife tool and creasing tool as the suitable replacement, WER worked closely with AG/CAD to identify the exact specification the company would require. Primarily processing corrugated sheets from B, C and E flute as well as double wall combinations of these flutes, the DYSS has a high-speed cutting tool and creasing tool that deliver a complete solution for corrugated sheet companies. “What the DYSS gives our business is the scope to exploit new market segments. We are now looking more strategically at the PoS, display and different packaging sectors. 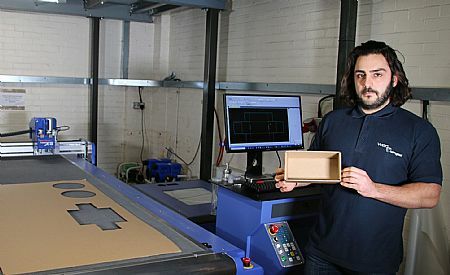 With the purchase of Scope Packaging Ltd into the WER Group in recent years, the DYSS also helps support that business with high-quality sample making in a wide range of product types. We also have the capacity and speed to process low-quantity fast turnaround production runs that would have needed to go on a platen in the past. Creating dies for small quantity work isn’t cost effective and the DYSS makes us extremely competitive and reactive in this new target sector."